RUMOUR: Sonic Generations Coming to Sony’s NGP? 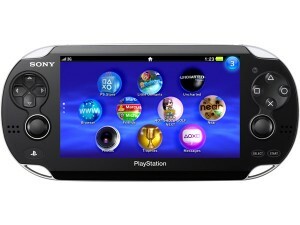 PlayStation news website PSPgweber has published what is apparently the launch line-up for Sony’s Next Generation Portable (final name now rumoured to be PS Vita) and Sonic Generations is among the titles featured. The website also claims the title is coming to PC, a platform SEGA themselves listed in a recent financial report before being later removed and unheard of since. No other info is given, but PSPgweber says to expect details to be revealed during E3. Nintendo Power recently unveiled a Nintendo 3DS version of Sonic Generations, so could the NGP and PC be two more mystery platforms for Sonic’s big 20th Anniversary game? E3 is just around the corner, so if the game is coming to those platforms, we should definitely find out there. UPDATE: ArchangelUK of SEGA Europe and Sonic Wrecks has received European and Australian pricing and release date information from SCEE. The theme will be available Wednesday 19th January for free to PlayStation Plus members, and cost €1.99/£1.59/$AU3.45 for everyone else. SEGA’s RubyEclipse has revealed that a Sonic the Hedgehog 4: Episode 1 Dynamic Theme will soon be available on the PlayStation Store for PS3 owners thanks to a joint effort from SEGA and Sony. 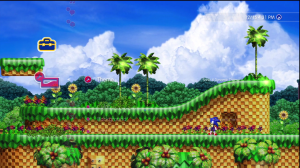 This theme is based on the game’s first stage Splash Hill Zone and features Sonic running and spin-dashing around, with an appearance from Dr. Eggman every now and then. Another cool feature is the ring sound effect we’ve all grown to know and love that will trigger when toggling around the XMB. This Dynamic Theme will be a part of this coming Tuesday’s PlayStation Store update in the U.S. and will be released shortly after in Europe, so maybe Wednesday’s European PlayStation Store update, if we’re lucky? The theme will cost $2.99 in the U.S. and for a limited time will be available free to all PlayStation Plus members. No European prices were given. If you missed the announcement, SEGA added exclusive Sonic 4 Avatar items to the Xbox Live Marketplace for Xbox 360 owners in December. Thanks to CobraRoll at the SSMB for the heads up! Will you be downloading this theme? Let us know in the comments. Want Sony Characters In ASR PS3? Place Your Vote! The team at the Official U.S. PlayStation Blog have set up a new feature simply called PlayStation Blog Share where users can set up suggestion polls to get their idea’s out there for consideration and get a clear idea of how high or low demand is for said suggestion with a positive and negative vote system. 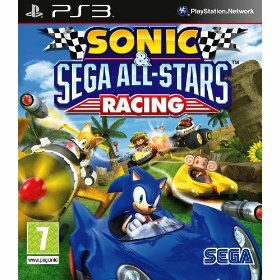 Casanova at the SSMB has set up a suggestion poll there for Sony exclusive characters for DLC in Sonic & SEGA All-Stars Racing PS3. If you are interested you can place your vote here. 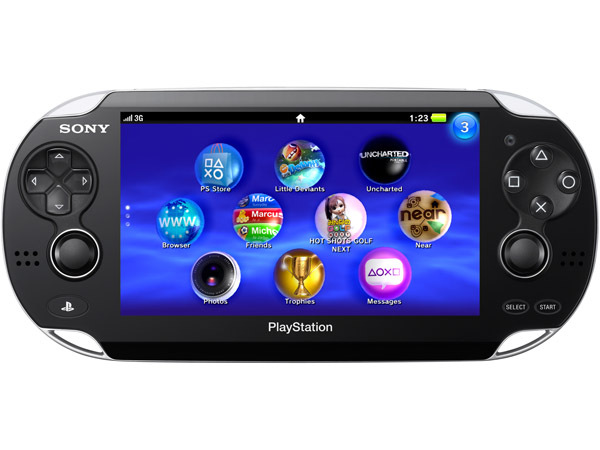 For those not in the know Sony have released the latest model in the PSP family, the PSP Go today and to celebrate the launch SEGA have released a bunch of their classic PSP games on the PlayStation Store. If you are after a classic Sonic fix on Sony’s handheld Sega Genesis Collection has Sonic 1 and 2 on it among all the classic Genesis titles also worth buying the collection for. No Sonic love for Europe but we’ll be checking next week’s PlayStation Store update so stay tuned to TSS! Sony Computer Entertainment have revealed 24 third party companies who have been granted development licenses to support Sony’s community focused virtual world PlayStation Home and among those 24 names is SEGA. PlayStation Home is currently available via PlayStation Network in BETA form but with all of this third party support should soon be on track to being complete. No info or media has been revealed as to what these third party companies plan on adding to PlayStation Home yet due to them only just getting their development licenses but it should certainly be interesting with the ability for these companies to be able to develop rooms themed around certain games as shown a while back with Sony’s titles. Could we see a Sonic themed room with rings, item boxes and Chao decorated around the room. Sonic 1 playable arcade machines in the corner? Maybe it could be like Sonic’s room on Sonic Shuffle? Either way, make it happen SEGA! “We’re reviewing the moderating system currently to provide better feedback on why levels are moderated,” he said, going on to explain: “Primarily, any level that is reported using the grief tool will be checked over by a moderator, at which point they’ll examine it in line with the EULA. If a level is found to be in violation of the EULA it will be moderated and you’ll receive a message to that effect. What are your oppinions on this? Has anyone with the game had their Sonic stages deleted off the server?